Meet RezRATE, the one-stop solution for scheduling, evaluating, and ranking residency candidates. Are You for Residency Interview Season? RezRATE was created because we understand how exhausting residency candidate selection can be. Every year you have to send out invitations, coordinate schedules, complete evaluations, organize feedback, and debate rankings. Making a good match takes time, but it’s worth the effort because each resident represents a huge investment your program is making in its future. The annual estimated cost associated with training and supporting a single resident can range from $180,000* to $224,668**. Multiply that cost by each residency year and then multiply that total again by the number of residents you plan to support. The final sum might seem staggering, but it’s not unreasonable given all the ways residents contribute to a program’s overall success and reputation. "How do I create an effective evaluation that addresses all of my program’s needs?" "How do I institute a process simple enough that even my busiest faculty members will participate?" "How do I compile candidate scores, organize evaluator feedback, and make ranking data easier for my team to visualize and compare?" The answer to all these questions is RezRATE, a suite of tools developed to help graduate medical educators make better decisions about residency candidate evaluation. RezRATE consolidates all your information into one place and simplifies every step of the process, from the invitations to the final rank list. Let us show you how RezRATE can get your team ready! Managing everyone’s needs can sometimes feel like an impossible task. That’s why RezRATE provides administrators with the tools they need to make the candidate interview process simple and successful. Generate candidate profiles with a few simple clicks. Create custom evaluations that reflect personalized selection criteria. Register candidate interview dates via invitation. 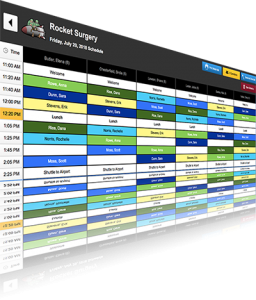 Quickly generate and modify schedules for interview day. Print materials for interview day participants, including: schedules, face sheets, name badges, and evaluation forms. 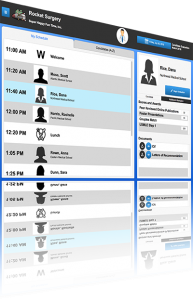 Modify candidate information and schedules with real-time updates. Assign different levels of system access to users based on their roles and responsibilities. 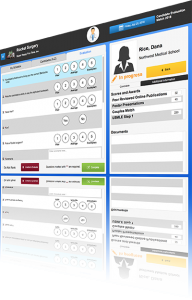 “At-a-glance” access to candidate profile information. The ability to preview or download candidate documents while perusing profiles. Charting tools with real-time scoring that create graphical representations of evaluator feedback for analysis and discussion. Rank list tools that allow evaluators to modify candidate placement, save different versions of the list for comparison, and export the finalized list for easy submission. Picture it! Interview season is over and you’ve finally finished processing your candidates. You’ve chosen the best of the bunch, but one more step remains before a great match can be made. All those fantastic, top-tier candidates you carefully selected after hours of rigorous ranking? They still have to rank you too. You only get one chance at a first impression, but don’t worry! RezRATE can help you make it the best one possible. Candidates don’t have to negotiate lengthy phone conversations or email exchanges to select an interview date. They pick what they want and get what they picked- with just a click! Candidates get their own personalized schedules with real time updates, which minimizes the opportunity for confusion and miscommunication. With RezRATE, last-minute changes don’t create last-minute headaches. Come interview day, you can greet your candidates with customized badges instead of hastily handwritten name tags. Make the interview process polished and personal to leave a lasting favorable impression. Ready to see RezRATE in action? *Pauwels, Judith, and Amanda Weidner. “The Cost of Family Medicine Residency Training: Impacts of Federal and State Funding.” Family medicine2 (2018): 123-127. **Ben-Ari, Ron, et al. “The Costs of Training Internal Medicine Residents in the United States.” The American Journal of Medicine 127.10 (2014): 1017-1023.